164/365 – “I’m Batman” nr.14, a photo by Luca Rossini on Flickr. Fourteenth day of the “I’m Batman” theme, the week is over and I’ll need more than a coffee to stay up for the weekend and the weddings! 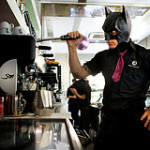 The Bat-Barman (the Bartman?) 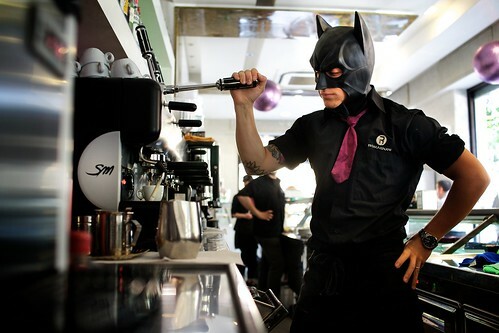 at the Bat-Bar is the only one who can serve me what I truly need. A double Bat-Coffee. Just I can’t figure out how do you approach people asking to pose for a pic ?! ?